KITTY LOVE is a handmade glass bead crafted by studio artisans in the style originally developed in Murano, Italy. It's engraved with KITTY LOVE and hearts and Susan's initials and hallmarked with 925 on the sterling silver core. 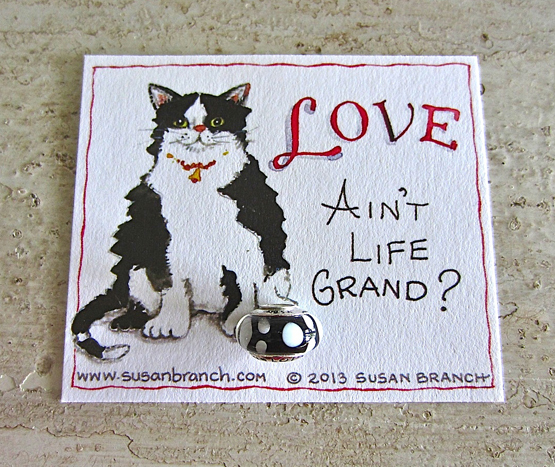 If you are familiar with Susan's blog you will have met Jack and Girl Kitty, Susan's kitty sidekicks and understand why a glass bead decorated in the tuxedo style is so appropriate for charms of love and luck. These charms will fit on many of the popular charm bracelets, and look just as cute on a ribbon or chain around your neck. They come on a Susan-designed gift card. Limited supplies, only available at our web store and only $34. each.